New Delhi, April 12: Months after receiving South Korea's prestigious Seoul Peace Prize for his contribution to the international cooperation and fostering global economic growth, Prime Minister Narendra Modi was conferred with Russia's highest civilian award on Friday. Russia announced that PM Modi would be decorated with Order of St Andrew the Apostle for his exceptional services in promoting the special and privileged strategic partnership between Russian and India. Narendra Modi Receives Seoul Peace Prize in South Korea, Says It's Time to Unite to Eradicate Terror. 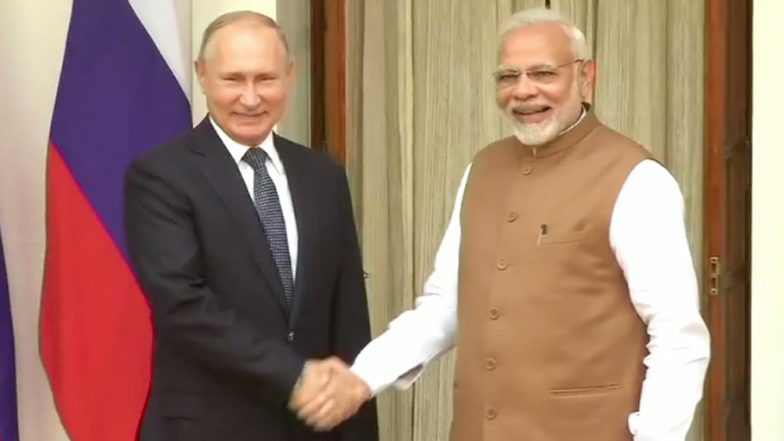 Announcing the award, Russian Embassy said, "On April 12, 2019, Indian PM Narendra Modi was decorated with Order of St Andrew the Apostle-highest state decoration of Russia -for exceptional services in promoting a special & privileged strategic partnership between Russian and India."